I Apologise To Engineer Abraham Byandala, Minister of Works and Transport in Uganda; I realise that I have been stupid and hereby regret my ways. I have been waiting for Eng. Byandala to issue a clarification about the statements so far attributed to him in the Eutaw Construction case of the Katosi-Nyenga road in Mukono because they make him appear to be of diminished intellect, whereas judging from his position in society and past responsibilities, he is most certainly not. In fact, I want to now apologise to Eng. Byandala because I am clearly the one who is stupid, as far as this issue is concerned. Stupid because my understanding of things is so much at variance with the reasoning put forward by Eng. Byandala and the facts of the case as they have been presented by the media thus far; and since it looks as if arguing to the contrary will be more frustrating than I can bear, I concede and hereby hang up my intellectual gloves. Stupid, I have checked, means, “lacking intelligence or common sense” and “dazed and unable to think clearly”. I am, I re-iterate, stupid; because I meet both definitions in regard to the matter of Eng. Byandala and Eutaw Construction of Uganda: you see, I have failed to understand the logic behind his actions in the Eutaw matter, and find that his explanation as presented to his Parliamentary colleagues and the media, only dazed my befuddled mind and made me unable to think clearly. These words were attributed to Eng. Byandala, honourable member of parliament. Due diligence, according to most explanations, involves investigations conducted prior to signing a contract or taking any particular act. In it’s most simplified format, due diligence is “first checking”. This is where my confusion began, because – again perhaps due to my mind being so simple – I would expect that an engineer would know this and follow logic. I was first officially introduced to ‘Logic’ while studying mathematics; and I am of the belief, maybe mistaken, that mathematics is a base, essential subject for people who study Engineering. Meanwhile, if my logic is faulty in determining myself to be stupid where Mr. Byandala’s statement makes sense, please blame it on my not having studied mathematics or even engineering the way he did. Before releasing that money or signing the contract, for instance, someone could have googled Eutaw, even as far back as 2010. This is smaller, by population, than most villages in Uganda, but that’s not the point. The construction company is the fifth entry –www.eutawconstruction.com. Nothing on their website points at the company ever having done work outside of the United States or even being interested in doing so. Even the most basic first steps of due diligence would have taken the phone numbers off the site – as the media eventually did – to call and confirm that, indeed, Eutaw was in Uganda. Google the names of the so-called Eutaw protagonists and you won’t find much about them on the internet either – which could raise suspicions over people managing million dollar contracts. One of them, Project Coordinator Steve Olvey, has a LinkedIn entry that outlines his duties and responsibilities on the project (titled ‘Mikono Project’ spelt like those people who make fake Chinese products) since October 2013. Before that, his profile says, he was Production Manager with one Avionics Interface for a year and one month, “…responsible for parts ordering and workflow management of cable assembly for the airline industry; created spreadsheets for invoice specific parts ordering and tracking…” And before that, he was ‘Operations Manager’ at Big Sky Tool Inc and Inventory Manager for The Home Depot in the US. Due diligence aside, though, you should read the interview Mr. Byandala purportedly did with The Observer. When, he says, suspicions arose about Eutaw, he consulted both the UNRA lawyer and the Attorney General of government “verbally”. “I told him, ‘I have a small problem in my office…'” Just Ushs165 billion! Again, because I am so stupid I have never in my limited interaction with commerce dealt with any supplier, carpenter, plumber or even wheelbarrow pusher in such an intelligent manner. I will continue typing out this apology while kneeling. You see, Mr. Byandala is a bastion in the fight against corruption in Uganda. I have realized that he is a hero and should get a medal rather than suffer the amount of angry abuse I initially levelled at him for allowing our scarce resources to go to waste rather than into health and education. It was in this same interview that Mr. Byandala name dropped his cabinet colleagues and a few other people as being involved or behind Eutaw Uganda, and revealed that “all” insurance bonds for construction contracts are fake. On top of that, he heroically named one Denis Ayo as being behind the fake contracts, “But you know Uganda, because of (his) connections, everything disappeared.”. 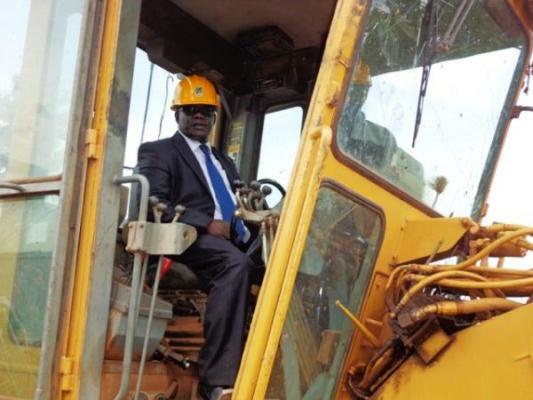 Interestingly, Mr. Byandala was guest of honour at an event a few months ago when Uganda joined CoST (the Construction Sector Transparency Initiative), which is supposed to increase transparency in the construction sector; so he doubtlessly is a champion of said transparency. I apologise to Mr. Byandala because for many years – even going back to the time he was in charge of roads or engineering or planning in Kampala under the old, ramshackled Kampala City Council, I have stupidly been campaigning for Uganda. Like an idiot, I always say we have good people and good things going on in this country. I should have consulted him, a national leader and studied professional, for such all-enveloping blanket statements that discourage investment and trade with Uganda. In my foolishness, I even considered that he should resign from his position as Cabinet Minister since his wise and eminent statements alone could impact negatively on government funding! I am so dense that I falsely reasoned that if he knew about said Denis Ayo and the fake insurance bonds as he stated in great detail to The Observer, he should NOT have told UNRA to sign before due diligence had been done on Eutaw. There’s that word again: stupid. Like me – and most Ugandans who expected much, much better from Engineer Abraham James Byandala; and most of all, those who will be voting for him again come 2016.
a day well spent with Ugandan Youths – there IS hope! Thanks for getting me this whole story. You indeed owe the good engineer an apology. You took him for granted and not only accused him unjustly of having the sense to seek rain in the shade, but also were a bit offensive in expecting him to behave in anyway but his own. That said, I have read this and must confess, I am stupid. By you definition, I am stupid. I am going to post this comment then go for some fresh air and perhaps lie down in the hope that this condition of stupidity is temporary. I’m even annoyed at your (and our) “stupidity. Oba abanayUganda twabaaki? You guy!!! Eh, I am even feeling stupid now. Some other chaps have declared themselves to be imbeciles! 🙂 very witty as usual. The icing on these Monday blues. But it hurts to be stupid,its like I have been stupid all my life. I need to find a new fountain of wisdom. Abagezi balyaaki? Is there another way to pen your not so wrong opinion without interfering with the dignity of Mr Byandala? He should lose his job for his role in this but please treat him the way you treat him if his name was something like Nasasira, Kuteesa, Kashaka, Muwhezi, Kaheru, Bigirimana and other name of the so called first class citizens who are consistently implicated in corruption scandals. His humanity may not be worth considering by virtue of his tribe but he is not stupid as you sarcastically imply. His mistakes do not define him. Sue him, throw him in jail, attach his property and recover all money lost but do not take away his dignity. He is a man with children and dependants, they should not have to deal with their father being addressed in such a manner by a self proclaimed social analyst. But again, you belong to the high and mighty, you may not understand the inherent, humane needs of the people who do not speak your language. We deal with this everyday on the streets, in government offices, in supermarkets. You are just being consistent with the way society in Uganda is structured. So go ahead, rip him apart. Good job… is it not your king that called us idiots on TV 🙂 clap clap clap…. There probably is another way, Nanteza, but this is the one I chose. Would that his name were Kaheru or that we were tribesmates (you would be amused to learn that we probably are! )…but neither of those count as useful in the above, and shouldn’t. Nanteza, its unfortunate that this article has affected you the other way. Just like our good Engineer, you’re claiming political witch (media in this case) hunt. When shall we stand and take responsibility for our mistakes without blaming the king, clergy, Acholi etc? We all make mistakes but there are stupid mistakes aka ‘sign contract and conduct due diligence’! Where are the procurement and bidding procedures on government contracts. Is his office the one stop shop for the entire process? A rhetorical question; but one, among others, that the situation clearly demands. Of us all, am the most stupid and am sorry I didn’t vote him in his constituency because am from Arua am really ashamed, for how long will he think that us as tax-paying Ugandan’s are smart and after him ? As if stupidity were not enough, where would one place his experience? We all know that experience is a hard school and that every one goes through it; but yet again, it should be the best teacher. People have said there could have been political pressure but I say that that alone couldn’t have made someone commit a ‘wrong’ mistake! The other day when he was appointed minister, I was eager after having read that his experience spawned years at KCC. His profile was nothing but riveting! But one other interesting thing that made his appointment catch headlines was his insistence that he always knew and God would reward him with a ministry one day. This was of course drawn from the hard and possibly good work at KCC. However, question that begets is: if indeed his appointment was guided spiritually, why wouldn’t his actions be? Whether Byandala is a Muganda, Munyoro, Musoga etc, his statements are not consistent with the man we expected he was. Simon Kaheru’s article, which I highly applaud by the way, has nothing to do with tribal criminalization unless Nanteza wants to shift the argument on those grounds, which I guess should be for another day. Lack of consistence pits Byandala and for that matter it’s not even enough to only say he’s stupidity. If Simon acknowledges stupidity, Byandala shouldn’t be an exception! I would entirely blame it on the “tiredness” JPAM has highlighted is taking country down the drain. Nice article @skaheru.